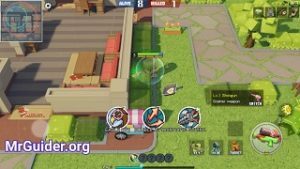 A few days ago we published a short article on Cardboard Clash game, a latest battle royale game by NetEase. In today’s post, we have covered everything you need to know about the game; Cardboard Clash guide and Cardboard Clash tips, cheats & strategy. You should not have any problem in understanding the battle mechanics as it is similar to other battle royale games. Your objective is to be the last one on the battlefield. So we will directly discuss how to enhance the character, what are stickers, how to get characters, gifts, about weapons, items, and in-game currency. And in the tips part below, we have shared our top tips(you can also share with us in the comment section below). Let’s dive in! 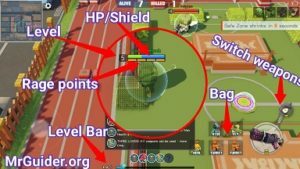 THINGS TO KNOW IN Cardboard Clash GAME! Unlike other battle royales games, In Cardboard Clash, character’s stats/skills/skills matter a lot. All the characters featured in Cardboard Clash game have unique skills and different stats which can further be increased using textbooks, sandbag, dumbbell, treadmill, and more items. For example – Candy is a character in Cardboard Clash game who can recover 25% of the health when you eat the burger. Charles has the ability to increase the attack by 35%. You will start the game with Victor who is one of the best characters in Cardboard Clash game. You will unlock almost all the game’s features by level 9; gift, stickers, enhance, and more. Let’s learn step-by-step and in detail! HOW TO GET CHARACTERS In Cardboard Clash? Cardboard Clash game features over 18 characters. Since you have only one at the beginning, you may want more. You can obtain the characters from the paper box. In the lobby, on the left side, tap the store option. There would be the first section named as BLINDBOX. From this section, you can buy two types of boxes; surprise blind box and mystery blind box. Surprise Blind Box can be purchased using the gold(earn gold from the battles). And the mystery blind box will cost you diamonds(you get diamonds every five levels – level 5, 10, 15, 20, and so on. You will also get from the activity rewards; daily login). From the paper boxes, you could get the characters you already own. For example; you have already unlocked Candy. And from the paper box, you get it again. Now, the game will convert this duplicate character into Frag Of Char item. You can use this item to purchase sticker packs, textbooks, and for characters. How to use? Tap the store option -> go to functional tab -> In the functional tab, at the bottom; head to the character tab -> there you can spend Frag Of Char. In a similar way, you can use Frag Of Sticker in the sticker menu(functional -> sticker) for stickers. As mentioned above, all the characters have different stats. Compare the stats with each other, analyze the skill and choose the one that suits you. All these items come in tiers; T1, T2, T3. In the inventory menu, tap on the item -> you can check the tier next to its name. High tier item grants more EXP and helps you in leveling up the stats fast. Paperbook is used in enhancing the skill. Sandbag is used in increasing the attack stats. The dumbbell is used in increasing the health stats. And the treadmill is used in improving the speed. How to get these items? STICKERS GUIDE – HOW TO GET AND USE? Usually, you get stickers from the sticker packs which can be purchased in the store in exchange for gold coins, gift score, season medal, the frag of stickers. If you have, then go to the inventory -> sticker -> tap the sticker and check its stats and carriable slot. Go to the character menu -> select the character -> sticker -> tap the suitable slot -> select it. In the battle, you will fight against 23 other players in real time for the first rank. The last one wins the match. All the players start the match from level 1. At the bottom of the screen, you can check the level bar. Collect the blue diamonds to level up. When you level up, you will have to choose a skill; long press the skill to check the details. For example; More Hamburger gifts you free burger(eat burgers to restore the health). Every time you level up in the match, you will get a skill. The game features a melee weapon(frying pan), guns(Shotguns, ranged weapons, throwables). Use these weapons to attack enemies when in range. But don’t hit the attack button when there is no enemy in range. Just below the HP bar, you can check the ammo or attempts or rage points. When it reaches 0, your character will not deal damage. So make sure to strike at the right time. When you kill the enemy, you will be able to loot his/her items and diamonds(level up). How To Get Gift Items? You can send gift items to your friends and earn gift points. You can obtain gift items from the store; functional -> cabin. Gift items include answers, turret doll, armin’s CD, non-stick pan, Pet-Cap, chicken, armband, magic toffee, paper rose. To send the gift, go to the friends menu -> tap the friend -> gift -. choose the gift. So that’s all for Cardboard Clash guide. Let’s take a look at our top Cardboard Clash tips, cheats & stratgey. For the best loot, we would recommend you to land on the depot. You will easily get the gun, armor, helmet, and lots of diamonds there. 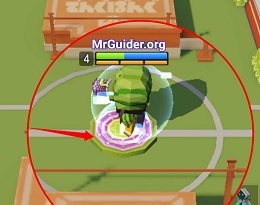 But if other players are also landing on the same spot, then change your direction and move to a less crowdy area. Use the virtual pad/joystick to land fast. When you level up in the match, you will have to choose one out of three skills. If you don’t know about the skills, then simply long press on them to check the advantage they provide. Usually, these skills help you in restoring the health, by shielding, and increasing the attack power. If you are low on health and have no shield, then find the healing and shield spots. Keep your character on these spots for a while for health and shield. Healing spots are marked by the + sign. Sheild spots are marked as shield cover. The shield is the most important factor. When exploring the battleground, you will get lots of items such as Hide costume, healing burger, turret, plane, blink, and more. Make sure to use these items at the right time. For example; If you are low on health, use the burger. Use fly item when a squad/enemy is chasing you. Use turret in the last moments; turret fires shots to the enemies. To run away from the dangerous situation, use blink item. Enemies can not see you in the bushes. Hide in the bushes to escape from the high-level enemy. Just below the HP Bar, there is a rage bar that shows you Rage. It reduces as you use the weapon to attack enemies. You can have a maximum of two weapons. We would recommend you to must keep a melee weapon(frying pan – high level) as its attack rate, rage is high as compared to other weapons. Additionally, if you want to improve the rage stats, “choose three lungs” skills when you level up. So these are the top Cardboard Clash tips from us. Now, it’s your turn. Share your top tips in the comment section below and don’t forget to share which weapon you use the most. Or if you need help, ask us in the comments.